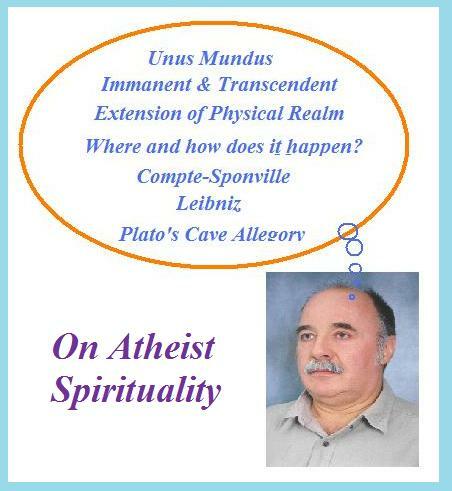 On Atheist Spirituality by Elemer E. Rosinger: In this series of essays, I explore and discuss spiritualization of materialistic atheism in support of Andre Comte-Sponville. These essays are further dedicated to Marie-Louise Nykamp. Essay I contains: A Short Story; Much More Wrong Than ...; Good Life ...; and The Poor Shall Always Be with Us? Essay IV contains: The Interplay between Our Affective and Cognitive Beings ...; Mere Sensation of Truth = Truth, or Is It Indeed? Back to C-S, and Starting with Its First Chapter; and On Chapter Two: Does God Exist? Essay V contains: Extended Harmony, and Growing Up at Last ...; On Chapter Three: Can There Be an Atheist Spirituality ? On Mysticism and Mystery: For How Longer Are We to Be Bound to Unfortunately Misplaced Words? Essay VII contains:Oh, that I, ... Problems with I, New and Old ...; And Again, the Same Finger ...; To Bring, or Not, Forth What Is Within You ...; A Question ...; Is it a Mystery? And Conclusions.